The meetings Module of the SugarCRM CE application will provide you with an easy way to manage your Meetings. There are few ways to schedue a meeting and in the next few lines of this tutorial we will show you how to do that via the dedicated page to that module. In order to manage the Meetings of your organization you are provided with a standalone page where you will see a table view of all the scheduled Meetings. In order to access that page you will need to navigate to Activities > Meetings. 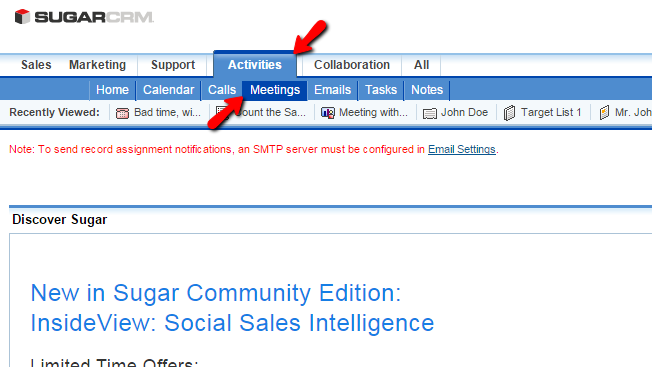 Once you click on the Meetings link you will be redirected to the actual page with the table view for all the Meetings added to your SugarCRM CE installation. In order to schedule a new meeting you will need to simply click on the Schedule a Meeting link located in the top Actions bar. Once you are ready with the Overview settings you can move to the other sections of settings where you will be able to assign an employee for that meeting and also to add invetees. When you are ready with all the settings please click on the Save button so you can schedule the meeting. In order to edit a meeting you will need to access the home page of the Meetings module and to find the meeting you would like to edit using the Search module at the top of the Meetings list. Next you will need to click on the small pencil-like button and you will be redirected to the same page you have used to schedule a meeting, however with most of the configuration fields already being filled. Please change those based on your needs and click on the Save butn so you can save the changes you have performed. In order to delete an entry you will need again to use the search module in order to find it and then you will need to select it for deletion by clicking on the small check box before the information for that call and finally you will need to click on the Delete button at the top of the table view with the Meetings. Congratulations! 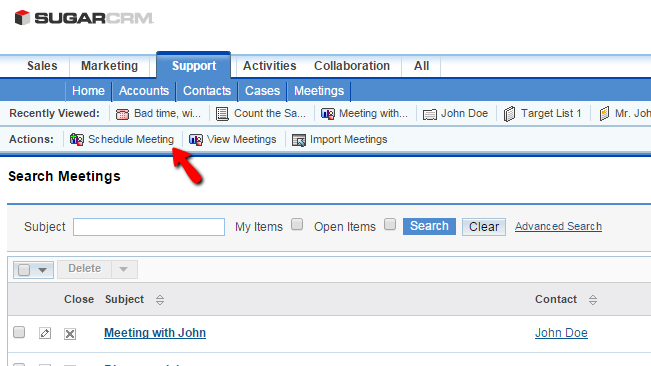 You can now fully manage the Meetings of your organization in SugarCRM CE!